Turn your Dwell Magazine aspirations into reality. We give you the tools to break down a Designer Look and make it your own on any budget. It can be daunting to see images of places that look so put together, especially if you peruse sites like Dwell or Apartment Therapy. You look at your own place and wonder how you can pull it off. But you can! It's just a matter of breaking down the look into manageable items that fit within your taste and budget. Here's a great example. 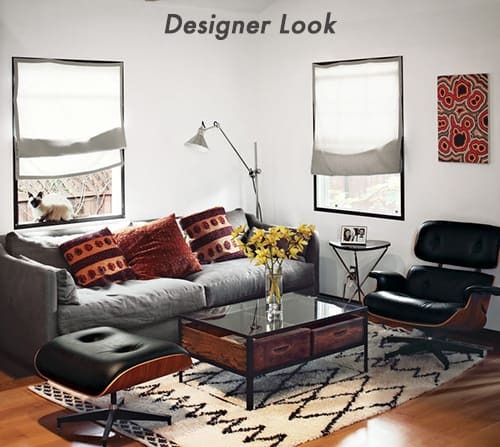 This is a “Designer Look” from Vincent Kartheiser's living room in his last place (before he got married). Looks pretty swanky, right? You probably recognize the Eames lounge chair and ottoman. The sofa and coffee table are from Cisco Home, a high-end furniture store based in Los Angeles. The rug is West Elm. You start adding the other items and feel your heart racing from all the $$$. Now here is the “Deal Look” that I've pulled together for you. How'd I do it? Let's first analyze Vincent's color palette, which is well-balanced. The furniture is grey and black, which anchors the room with calm neutrals. The red and yellow/orange from the pillows and art gives just the right pop of color. Next, look at the key items in the room to find pieces that reflect you and your lifestyle. Not only are you working within a budget, but you may be more willing to spend on a sofa, for example, than your friend, who'd rather shell out for art because he has a dog who'll chew up the furniture. Really think about how you spend your day and what matters to you in deciding how you want to spend on each item. With all you different gentlemen in mind, I've curated multiple alternatives for each key item from Vincent's living room below. And to help you compare and decide, I created handy picture boards with your options listed by numbers, and then laid out the details for each numbered option underneath. You can mix and match according to your preferences, or get inspiration to find other things you like. 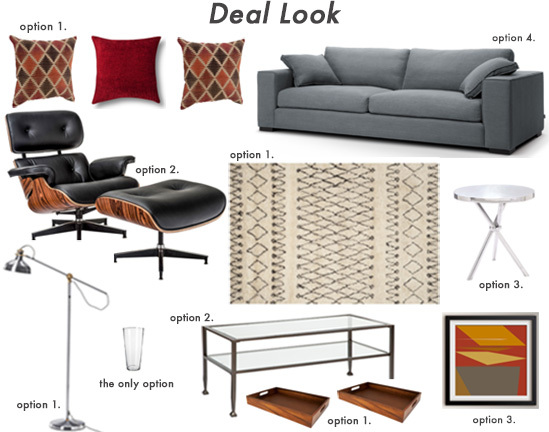 And you can always reference the Deal Look to see how it might all come together for a complete look-for-less (each item included there is marked by an asterisk below). Step one: the sofa. For most people, this is the piece of furniture that they will be using the most. It is also likely to be the most expensive item in your living room. Between those two factors, you'll want to balance how much you spend with look and comfort. 1. Clare Loveseat from Target, $535 – This loveseat is a thrifty, but smaller option. If you live in a smaller space, this may be a good option for you. Note, however, that it does not mirror the look of Vincent's sofa as closely as the other options below. 2. Stockholm Sofa in Rostanga gray from Ikea, $899 – Can you believe that Ikea costs more than Target? To be fair, this is a full-sized 83″ sofa. Although sleeker than the Designer Look sofa, it is closer in appearance than the Target loveseat. 3. Shelter Sofa from West Elm, from $1299 – We're getting closer to the Designer Look here, and this sofa comes in three different sizes. You can also customize the fabric to your color or lifestyle preferences. 4. 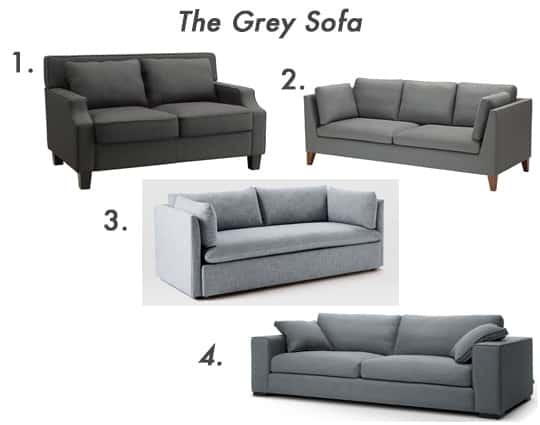 Sitka Sofa Thunder Grey and Baroque Black from Article, $1399* – This is my pick for the Deal Look. I'm willing to spend a bit more on a sofa because I used my last one for nearly 10 years! I sit on it every night when I get home from work, watch tv on it, read on it, nap on it, eat on it … you get the picture. As much as I appreciate style and design, I ultimately want a comfortable cushy place to do all my favorite things. 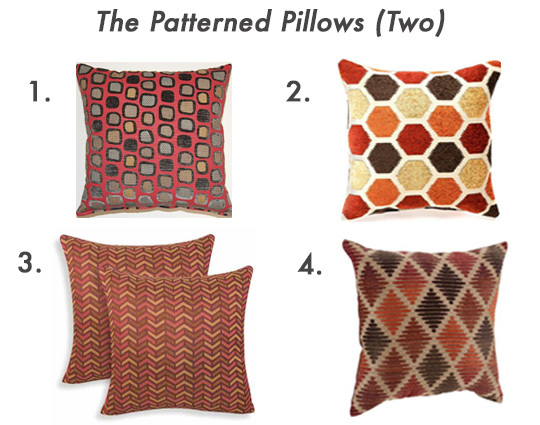 If you take a close look at the middle pillow in the Designer Look, it has a subtle pattern. Because I know just how much you guys love choosing throw pillows, though, I picked out solid colored pillows for your consideration. 1. Westfield Chenille Toss Pillow in Red from Target, from $17* – Chenille feels soft and cozy. Go ahead, snuggle up to my pick! Note that this pillow comes in a couple of sizes, and that it is the most red in tone (read bold) out of the bunch. 2. Wilderness Ridge Throw Pillow from Wayfair, $30 – This 18″ x 18″ pillow actually does have a subtle pattern to it. The front is made of chenille, like the Target pillow, but the back is faux leather. Flip the pillow around and you have a different pillow altogether. Who doesn't love a two in one? 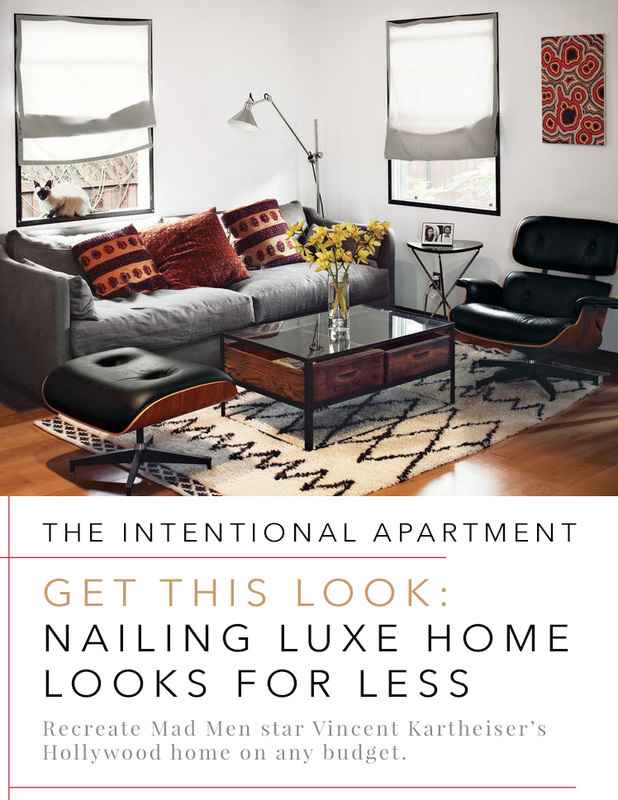 Also, this red has hints of black in it, giving it (and thus your sofa) a darker tone. 3. Mainstays Baked Clay Suede Decorative Pillow in Rust from Walmart, $8 – Can't beat this price! It is made of faux suede, though, so it might not be the most stain resistant option. And as the color “rust” suggests, this 18″ x 18″ pillow is red-orange (and more orange than option 4 below), which would add lightness and warmth to your room. 4. Lindon Pillow in Rust from Pier 1, $20 – Made of polyester and nylon, this 20″ x 20″ pillow is probably the most durable in terms of wear and tear. 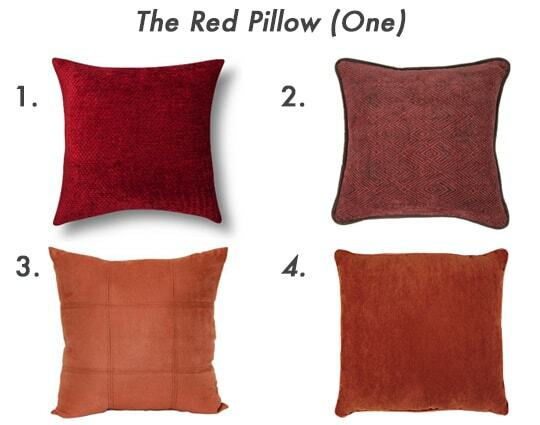 As for color, this pillow is also red-orange, but more red than option 3. Flank that solid colored pillow with two patterned pillows. Pick a geometric pattern that you like, from lines, hexagons, arrows, or diamonds. Or just close your eyes, spin a few times, and then point! 1. Peloton Throw Pillow from Wayfair, $32 – This 17″ x 17″ pillow has a fun mod vibe with a graphic feel, almost like a Lichtenstein print. Can you dig? 2. HFI Block Party Jacquard Throw Pillow from Kohls, $20 – With an eye-catching, contemporary look, this 20″ x 20″ pillow is sure to liven up your living room. 3. Mona Woven Geometric Toss Pillows (set of 2) from Walmart, $29 – Twice as nice, you get two pillows at this price! I know for some of you, that might just seal the deal. 4. Chenille Diamonds Decorative Pillow from Walmart, $17* – Although this 22″ x 22″pillow has a large pattern, the colors are muted, so don't be afraid of it. Diamonds can be a man's best friend, too. 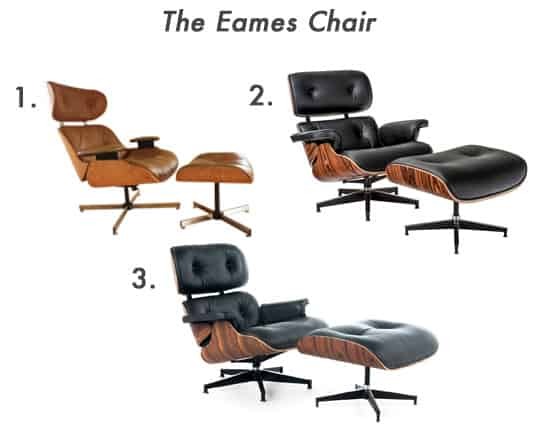 Ah, the iconic Eames lounge chair and ottoman. Because this beloved item is reproduced by so many vendors, the overall look may seem similar, but there are differences. Which one you choose will come down to quality and price. If this is something you're into, I highly recommend taking the time to research antiques (the price will run the gamut), high quality reproductions (usually under $2,000), and even the real thing (about $4,500). 1. Vintage chair in tan from Chairish, $375 – I know it's not black, but look at that price! I couldn't resist posting it. If you're into antiques, you should also check out 1stdibs.com, Craigslist, and your local antique and flea markets and stores. I love a good find, so post them or send them to me! 2. Replica with Rosewood Veneer from Poly + Bark, $799* – This chair is made of top grain Italian leather and seven-layer plywood. The seat also swivels 360 degrees. 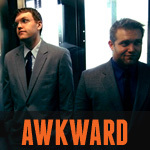 If you're not looking for an investment piece, this is a pretty good option for you. 3. Replica from Rove, $1,800 – This chair is made of full grain Italian aniline leather, braided thread used with Lockstitch to ensure seams stay in place, and wooden veneer made of First and Second grade American Timber and finished with Italian lacquer. If you need something even more budget friendly, Ikea's Poang offers a reminiscent shape for $159. No, you're not seeing triple. The rugs above DO all look just about the same because this pattern is on fire. 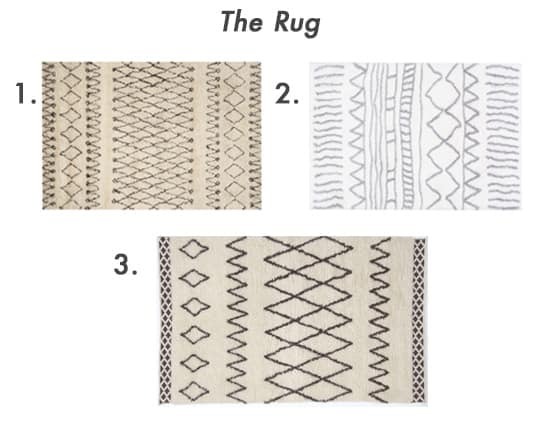 The Designer Look rug is option 3. Consider not only your price preference, but also the size of the rug you need for your space. 1. Safavieh Handmade Casablanca Moroccan Cream / Brown N.Z. Wool Shag Rug (4′ x 6′) from Overstock, $127* – Made of New Zealand wool, this cream and brown rug is a good size for a smaller living room. 2. nuLoom Cloudy Shag Moroccan Geometric Grey Rug (6'7″ x 9′) from Overstock, $135 – This white and grey rug is a little larger and is made from polyester, which prevents shedding. 3. Kasbah Wool Rug from West Elm (5′ x 8′), $499 – This is Vincent's rug and is available in a number of sizes to fit your living room. It's handcrafted of wool by artisans in India in a Fair Trade Certified facility. The coffee table in the Designer Look comes with the trays. But we can DIY that! 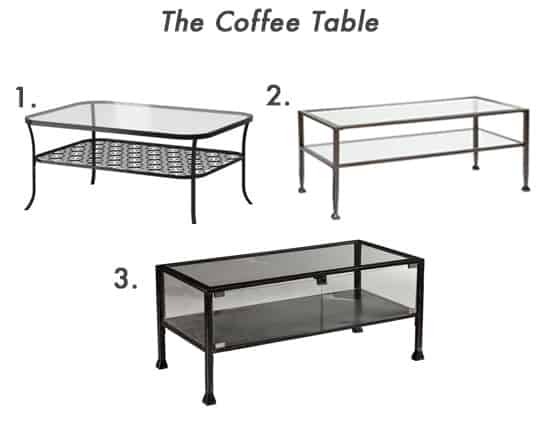 It's not hard to find a black metal glass-top coffee table with a shelf for trays. Here are your options. 1. Klingsbo coffee table from Ikea, $80 – Although this is the most affordable option, it looks the least like Vincent's coffee table with its curved edges and the lattice-work shelf. 2. Tivion Rectangle Cocktail Table from Target, $181* – My pick. This is a pretty darn close second to Vincent's coffee table. 3. Upton Home Display / Terrarium Coffee / Cocktail Table from Overstock, $186 – The terrarium gives this coffee table a different feel, but it's so hipster, I thought I'd throw it in. Part two of our DIY coffee table: wooden trays to slip into the coffee table shelf. 1. Acacia Wood Serving Tray from Target, $20* – My pick. Looks good, matches the wood veneer of the Eames chair, and the warm color of the acacia wood complements the pillows and the art. 2. Cheungs Shabby Tray from Wayfair, $27 – This tray will give you a darker look and won't stand out as much from the coffee table. That may be just the subtle feel you're going for. 3. 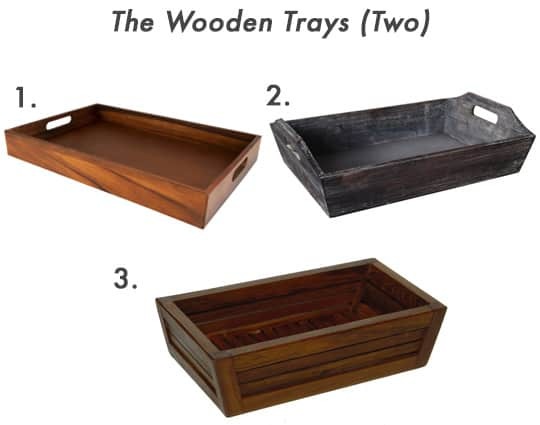 Aqua Teak Amenities Tray from Wayfair, $35 – A slightly different look without handles and with more lines. Do you like? Sometimes, less options is better. 1. 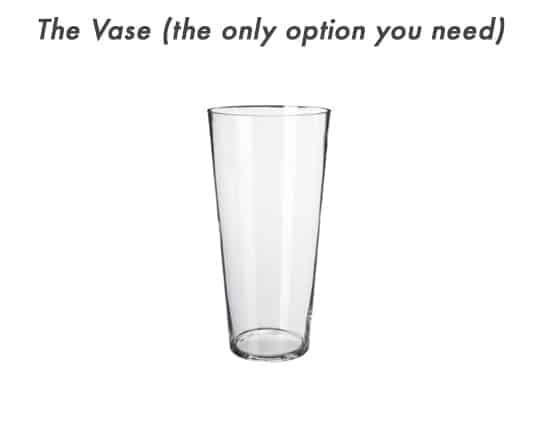 Bladet Vase from Ikea, $10* – No need to spend on this item. Enough said. 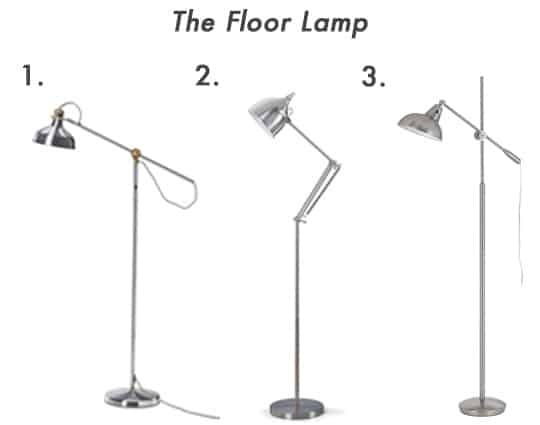 You'll get lots of use out of a classic task floor lamp. In fact, you might already have one that you can repurpose. 1. Renarp lamp from Ikea, $45* – Although this lamp doesn't look exactly like Vincent's, it's the best bang for your buck. Note, however, that it is two-toned. 2. Artiva USA Silverado Lamp from Overstock, $114 – This is a bit cleaner looking than the Ikea lamp, as it comes in monochromatic silver and without the cords sticking out around the head of the lamp. 3. Cal Lighting Brewton Lamp from Wayfair, $141 – With the head that can be adjusted along the base, this lamp looks the most like Vincent's lamp. 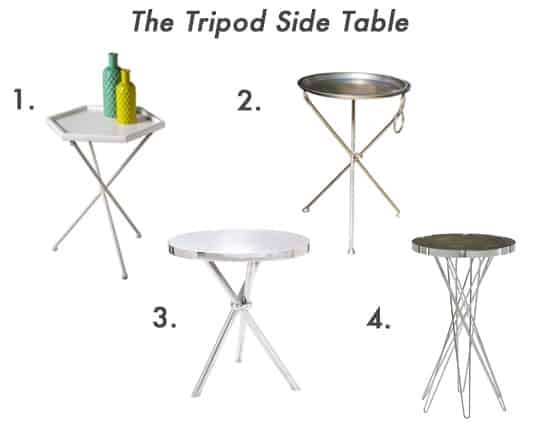 The key feature of the Designer Look side table is the silver crossed tripod legs. All of your options here have got the legs, but bring their own unique edge. Which one do you prefer? 1. Hexagon End Table from All Modern, $73 – This table is white, instead of black, and has a hexagonal shape. 2. Everson End Table from All Modern, $92 – This table is easily storable with its collapsible legs and has an antiqued look to it. 3. The Great End Table from All Modern, $178* – The simplest of the bunch, this table with its clean lines is my pick. 4. 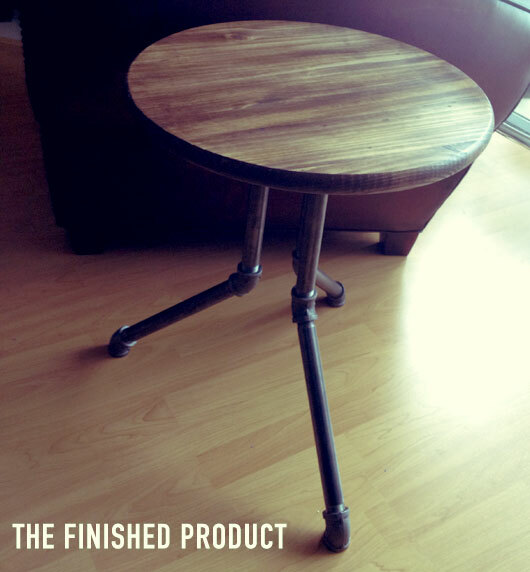 Hidden Treasures End Table from All Modern, $180 – Maybe you prefer the wooden top and hairpin legs of this table. If you'd like a DIY option with an industrial aesthetic, you can make Primer's DIY side table for only $63. Art is incredibly personal. I've selected a few things that may speak to you. 1. 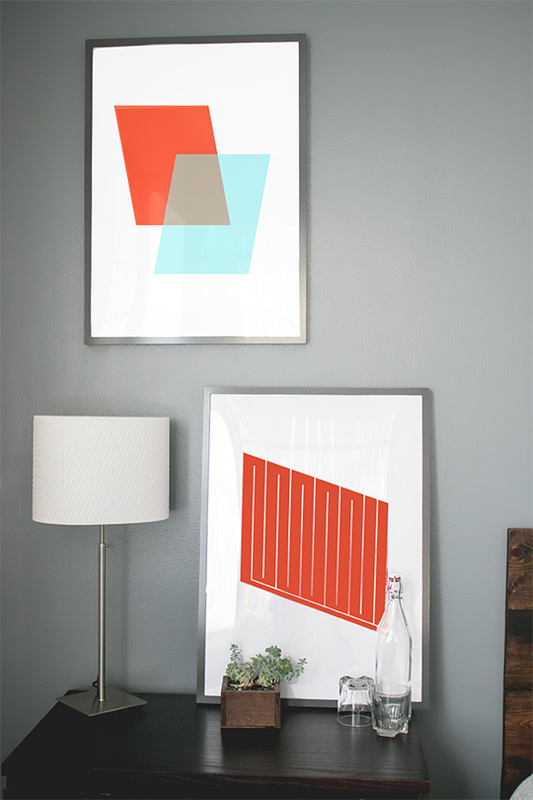 Modern Art, $3 – For one low price, download this geometric print instantly in three standard sizes. Get a frame from Ikea or Target and you're good to go. 2. Abstract Art, from $10 – This digital art comes in both rectangle and square prints and with options for borders. Decide on what you'd like, put in your order, and it will be printed on matte Kodak Endura Professional Paper for you. 3. Retro Art, from $15* – This square Giclée print comes in four sizes, starting from 8″ x 8.” You can also pay a little more to have it printed on canvas and wrapped on stretcher bars. 4. Retro Art, from $20 – This square canvas print is available in six sizes. If you live in the States, it comes gallery wrapped and ready to hang. 5. Geometric art, from $20 – You can get this Giclée print in a few different sizes custom trimmed with 1″ border for framing. 6. Abstract Southwest Art, $25 – This is a soft gloss 8″ x 10″ Giclée print, but you can request it in larger sizes, as well. 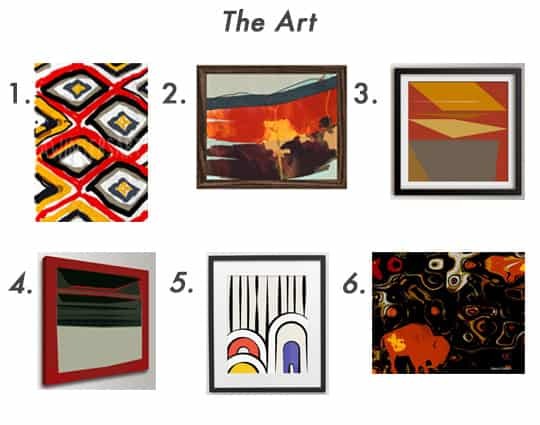 And of course there are plenty of options in Primer's Free Art Download series like these abstract printables. Michelle is an interior stylist, antiques collector, art and music lover, and wannabe painter living in Los Angeles. She likes bourbon and wine, traveling, and is a recovering masochist (i.e., attorney). Check out her website www.thecuratedhive.com and follow her on Instagram: @thecuratedhive and on Pinterest: @thecuratedhive. interestingly, I think the Primer re-design is a better, more masculine design; the inspiration image is a bit too effeminate for my taste. I also think that Eames chair has become way too cliche and overused – the cheaper tan option adds a nice little twist. Glad you like it! What do you think is effeminate about the original? I’m not seeing that. I think it is just the pillow and artwork patterns – the soft curves and circles. For some reason, I could just as easily see the inspiration room as being a bachelorette pad. If you can find a Pottery Barn outlet store near you that West Elm grey sofa is half the price around $600 right now. Was just looking at it. Quality is decent, fabric decent, comfortable enough (moreso than IKEA) and long enough where you could stretch out on it in case youre in the doghouse. Yes, love those outlet stores! Thanks for sharing. Thanks for the article. I need a rug for my new place. I was thinking about going dark with it but now you’ve changed my mind, cream-colored it is! So glad! Would love to see your pictures! Do you know what kind of blinds those are? They would look great in my house. They are draped or relaxed Roman Shades. You can get regular Roman Shades (no draping, just straight across with a sort of hard pleated look) from most stores, including Home Depot. But you have great taste, you can find this more refined look at any store specializing in window treatments. For example, try Smith and Noble or Blinds Galore. If you’re crafty, you can find DIY tutorials online. Hope that helps! Perfect! i already found some i want!